Nominations are being accepted for VCOG’s Freedom of Information Awards, to be presented in the fall of 2016. Entries should be submitted by Nov. 2, 2016, by filling out the form below or by mailing the same information to VCOG, P.O. Box 2576, Williamsburg VA 23187. Awards are given to citizens, media and government for their recent efforts in keeping Virginia state or local government open and accountable to the public. Past award winners for citizens have included VPAP founder David Poole, an Onancock retiree who represented himself in general district court to force the town manager to release his employment contract that the then-manager claimed was a personnel record, and a civic hacker who has worked to open up databases on court case information. Media award winners have included reporters and editors at the Daily Press, Roanoke Times, Bristol Herald-Courier and the Virginian-Pilot. Government award winners have included Delegates Jim LeMunyon and Mark Keam, former Senator Harry Blevins and VDOT. Click her for a nomination submission form. Mark your calendars for VCOG's annual conference! The suit arose as a side issue to a legal challenge being brought to the way several of Virginia’s legislative districts have been drawn. The plaintiffs’ request for legislative correspondence was resisted by six current and former state senators of both political parties. The ruling dealt strictly with the discovery process during litigation. It did not interpret the right to withhold documents under the working papers exemption to FOIA. When public bodies go in to closed session, there is a suggestion in FOIA that minutes be taken, but it’s not required (“Minutes may be taken during closed meetings . . . but shall not be required,”). VCOG has advocated in the past for some sort of written or recorded minutes for use only in the event of a dispute. Though not going so far as taking minutes, the City of Alexandria has nonetheless taken a positive step toward citizen accountability by publishing a report (and posting it online) that documents the number of times council went into closed session, the legal rationale for each session and the votes to initiate and certify those meetings. Mayor Allison Silberberg said the report was part of her ethics and transparency initiative. “Anything that we can do to add transparency to our governance and process is a good thing,” she said. Those who launched the Virginia Coalition for Open Government 20 years ago were on hand to toast the organization's continued progress at a cocktail hour and dinner at Richmond's Boathouse Restaurant at Rocketts Landing Sept. 22. John Edwards of the Smithfield Times and Bill Millsaps, formerly of the Richmond Times-Dispatch, recalled the early days of gathering supporters and funds. They praised the tenure of Frosty Landon as executive director for the first 10 years, and the hole left by the untimely death of their colleague Stewart Bryan in 2015. Christian & Barton attorney Craig Merritt, who drew up VCOG's incorporation papers and other legal documents, and Peter Easter, who secured participation in the coalition by the Virginia Association of Broadcasters, were also present to pay tribute to Ginger Stanley, who served as an ex officio member of VCOG's board as head of the Virginia Press Association until her retirement in September. 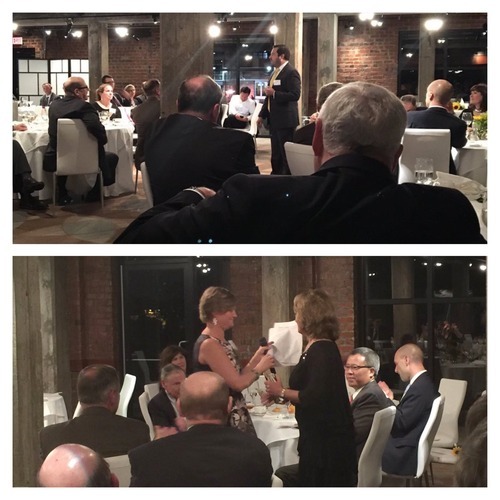 VCOG's current board president, Craig Fifer, applauded the vision of the founders and praised VCOG's ability to adadpt to changing technological challenges (top photo). VCOG's director, Megan Rhyne, presented Stanley with a star award recognizing her contribution to VCOG and her work towards open government in Virginia (bottom photo). Rhyne wrote about the coalition's origins and Landon's impact on both the organization and her own work in an op-ed piece for The Roanoke Times, reprinted here on VCOG's website. Many thanks to our event sponsor, Dominion, and our major contributors, like VAB, Raycom Media, Threshold Counsel, The Roanoke TImes, the Gannett Foundation, WTVR, VPA and Willcox & Savage. It's also not too late to support our 20th anniversary fundraising effort by making a contribution today! The work groups established by the FOIA Council’s committee on records — one on personnel records and another or proprietary records — came up empty handed. That means the incremental changes to the exemptions previously recommended by the committee to the full council will proceed, but not any major revisions. The proprietary records work group tried to somehow consolidate or combine the 28 exemptions in the proprietary records and trade secrets section of FOIA. Many agencies wanted to keep their separate exemptions, and the stakeholders couldn’t agree on definitions of “proprietary records” or the interplay with attorney fee recovery issues. The personnel records work group was tripped up by differing opinions of what should and should not be considered a personnel record and about the interplay with the administrative investigation exemption for employee grievances. There are specific changes that were earlier approved for this exemption, namely moving the salary and expenses exemption to the exemption currently found in another section to the same section as the personnel exemption, that will still go forward as part of the council's omnibus revision for the 2017 legislative session. The Supreme Court of Virginia has agreed to hear the appeal by the Daily Press in its case challenging the Office of Executive Secretary’s refusal to turn over a database of court case information. VCOG signed on to an amicus brief urging review of the case. Following a kerfuffle over a Loudoun supervisor texting members of a board committee during the committee’s meeting, the full board ultimately decided not to ban the practice. One supervisor said he “vehemently” apposed the ban, while another suggested the measure was needed because “transparency and perception” mattered. A third suggested it was better for the board to adopt a ban rather than have the General Assembly impose one on them. The proposed ban was tabled on a 5-3-1 vote. Questions arose regarding the Town of Strasburg’s purchase of a $100,000 parcel of land following a closed meeting some said was improperly called. The real estate exemption to the open meetings law attempts to protect the bargaining position of the government, but in this case, the purchase price had already been agreed on by the seller and the town manager had already signed for the purchase. The closed meeting was to discuss approving the purchase. A federal judge sided with the Department of Corrections in ruling that the department’s director need not give a deposition about how or why video surveillance recordings relevant to an inmate’s lawsuit were destroyed and not managed in accord with the Public Records Act. There was no evidence the director had knowledge of the records’ management in this specific case, but the judge did suggest that the Office of the Attorney General look into record keeping compliance. Vice Chair of the FOIA Council, Sen. Richard Stuart, has been hired as the new county attorney for Westmoreland County. the Daily Press followed up with a story about the Virginia law that prohibits public identification of facilities where instances of infectious diseases are reported. In response to a story about whether school districts were using scheduling to manipulate standardized testing, as they had been warned by the Virginia Department of Education not to do, the DOE refused the Virginian-Pilot’s request for SOL course enrollment data. The DOE disclosed some of the database, but said students could be identified if more data was released, even if personal information was stripped out. A memorandum of understanding signed by the Department of Corrections states that it is for the “purchase of drugs to be used exclusively for implementing the lawul order of the court for a death sentence by lethal injection in the commonwealth,” but because of a recently enacted state law, the MOU turned over to the Richmond Times-Dispatch did not identify the vendor of the drugs. The purchase price had been redacted, too, but after being challenged by the paper, the DOC eventually revealed that it would pay $16,500 for each execution, more than 30 times higher than what it paid last year ($525.14). A Pittsylvania County judge entered a final order requiring the county Agriculture Development Board to keep and produce minutes publicly for every meeting it holds over the next 18 months. Norfolk Sheriff Bob McCabe has temporarily taken over the Hampton Roads Regional Jail amid scrutiny over inmate deaths at the facility. McCabe pledged more transparency at the jail and in September released the names of 18 inmates who died since January 2012. He also disclosed surveillance video taken outside the cell of Jamycheal Mitchell, who died in August 2015. In response to Norfolk Mayor Kenny Alexander’s criticism of the way the police department handled reporting of its internal affairs investigations, Police Chief Michael Goldsmith informed the city council that his office would begin disclosing whether investigators found enough evidence to back up complaints, but he said he still wouldn not tell complainants whether an officer was disciplined or how severely. A federal district judge allowed a Loudoun County man to proceed with his lawsuit that accuses the county of blocking him from making comments on the county’s Facebook page. Charlottesville adopted new rules for the comment period during city council meetings that require potential speakers to sign up for a lottery system. Under the new system, 12 speakers are selected at random before each meeting rather than the first-come-first-served process previously in use.